ITIL does not specify the structure of the service desk, it simply provides guidance on what is possible, and has been seen in best practice in the real world. 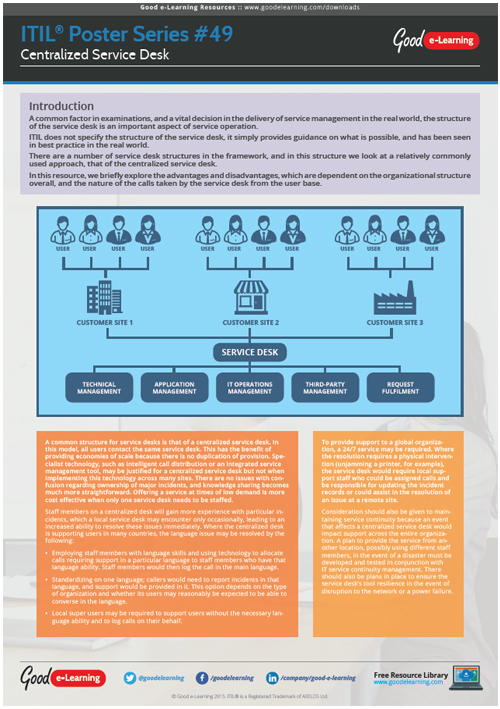 There are a number of service desk structures in the framework, and in this structure we look at a relatively commonly used approach, that of the centralized service desk. In this resource, we briefly explore the advantages and disadvantages of the Service Desk, which are dependent on the organizational structure overall, and the nature of the calls taken by the service desk from the user base.